What kind of retreats and services do Feathered Pipe offer? It’s simple! You pay a $500 non-refundable deposit to initiate your registration. Winter retreat and travel program deposits vary by program. Upon initial online registration, our administrative staff will contact you to confirm receipt of your registration and assist with finalizing your choice of accommodation and transportation requirements. For summer retreat programs, all final payments are due eight weeks before the start date of your retreat. For winter retreats and travel programs, final payment is due 10 weeks before the beginning of program. Payments beyond the initial deposit may be made in installments. If you have questions concerning the registration process, feel free to contact us via email at info@featheredpipe.com, or call the office at (406) 442-8196. What is included in the price of workshop tuition? Program tuition includes cost all instruction and program activities. Upon registration (excluding Group/Organization and Personal/Private, which MUST be booked in advance), Feathered Pipe office staff will contact you to reserve your preferred accommodation choice. Please visit our accommodation page to view the many options for lodging. What is included in the accommodation fee? Pricing for accommodations includes meals and use of all amenities. Amenities include full access to bathhouse, sauna, hot tub, as well as all Feathered Pipe Ranch facilities and grounds. What is not included in retreat tuition and accommodation costs? Massage and bodywork, optional Airport Shuttle Service, and any additional expenses (unless defined in the retreat listing) for day excursions off of ranch grounds, such as rafting trips, sightseeing tour, etc., are available but not included in retreat tuition cost. What kind of accommodations are available at the Ranch? Indoor accommodations at the Ranch include comfy 3 and 4-bed rooms in the Main Lodge; each with one twin bunk, and one or two twin beds and a full bath. The Ranch Chalet has 6 double rooms with private or shared baths. The Honeymoon Cabin and Sai Condo are available for those wanting to be more immersed in nature, sleeping 2-3 people. If you stay in Sai Condo, you’ll use our shared bath house with all its amenities – shower, sauna, hot tub, and the chance to get to know your fellow guests who are staying in our tipis, tents, and yurts. Teachers Cabin and Lake Cabin are available as guest accommodations for select retreats. Both have two large private bedrooms with queen-size beds, a dining/living room, and a shared kitchen with all cooking facilities. Teachers Cabin is nestled in the woods with a small creek running just outside and is located near the bathhouse. Lake Cabin is located across the grand lawn from the Main Lodge with a large back patio overlooking the lake. 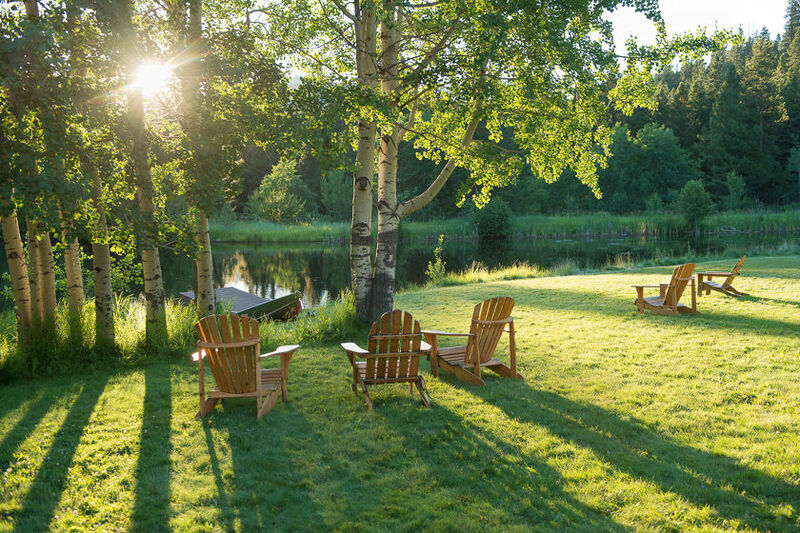 Be advised if you are staying in the Lake Cabin that large the garden-side room will used for registering arriving guests until 6:30 pm on arrival day, however that space is not open to guests during the week for most retreats. Outdoor accommodations include yurts, tipis, and tents. We provide raised platforms, foam pads or mattresses, light-weight sleeping bags, pillows, blankets and small camp lights. You are welcome to bring your own sleeping bag if you wish, but we have more than enough bedding to keep you warm no matter the weather. For those choosing to stay in our yurt,deluxe wall tent, tipi, or tent accommodations, our bathhouse will be your bathroom and shower facility which is not more than a five minute walk from any outdoor accommodation. Give us a call if you’d like to explore whether a particular outdoor lodging choice is right for you. Feel free to view the Ranch map get an idea of the layout of the Ranch and the location of various accommodations. Are partial scholarships or financial assistance available? Partial scholarships are available for those needing financial assistance. Recipients assist ranch staff in free time and during programs. Click here to submit an online application. Tax deductible contributions to this fund are always welcome – click here to donate. Are my retreat expenses tax deductible? The Feathered Pipe Foundation is a registered non-profit 501(c)3 organization. Therefore, expenses of attending a Feathered Pipe program, including travel and housing, may be deductible for US federal tax purposes as an educational expense if incurred to maintain or improve professional work skills. Consult your tax adviser for details and to confirm your eligibility for deducting workshop expenses. What is Feathered Pipe’s cancellation/refund policy? For Feathered Pipe and Blacktail Ranch retreats, final payment is due eight weeks out. For cancellations from eight weeks to two weeks out, THERE IS NO REFUND, however we will credit any payments over the deposit to another workshop in the same calendar year. For cancellations within two weeks of the start of your class, there is NO REFUND AND NO CREDIT. A workshop may be transferred to another person (minus the non-refundable, non-transferable deposit). For winter retreats, final payment is due 10 weeks out. For cancellations up to 10 weeks out, THERE IS NO REFUND, however we will credit any payments over the deposit to another workshop in the same calendar year or during the next retreat season. For cancellations within 10 weeks of the start of the tour THERE IS NO REFUND, NO CREDIT, AND NO TRANSFER. For travel programs, the deposit, payment, cancellation and refund policy will vary based on the requirements of that tour. Please see the specific travel program listing for details. Our cancellation policy is firm, therefore we strongly suggest purchasing travel/cancellation insurance (www.travelguard.com or www.travelinsured.com), or calling Flathead Travel at (800) 338-8785. All cancellations must be received in writing; refunds will be remitted within 30 days. To which airport should I fly? We recommend the Helena Regional Airport for those coming to retreats and programs at the Feathered Pipe Ranch. Direct flights into Helena currently originate in Salt Lake City, UT (Delta Airlines), Denver, CO (United Airlines), Minneapolis (Delta Airlines), and Seattle (Alaska Airlines). We strongly suggest that you book your flight to arrive on Friday (a day early) and enjoy a night in beautiful downtown Helena, as unfortunately it is not uncommon for the major airlines, particularly out of Salt Lake City and Denver to overbook flights to Helena. That being said, travel insurance is recommended. Airlines fly in from all parts of the country on a regular basis, with Delta serving those flying from the East Coast, Midwest, Mountain and West Coast via their Minneapolis and Salt Lake City hub, United Airlines serving passengers from all over via the Denver hub, and Alaskan Airlines serving West Coast flyers via their Seattle hub. Missoula International Airport and Bozeman International Airport are also feasible points of arrival but will require a two-hour commute via bus or auto that you will need to arrange yourself. For those interested in art and cultural events, Missoula is a great place to spend a few extra days. If you are planning to go to Glacier National Park consider Great Falls, and Bozeman if you wish to spend some extra time in Yellowstone National Park. If you are coming for a Blacktail Ranch retreat, we suggest that you arrive either at the Helena Regional Airport or Great Falls International Airport as the Blacktail is about an hour’s drive from either airport. Note: Shuttle service only available from Great Falls for Blacktail Ranch retreats. How do I get from the airport to the Ranch? For those coming for a Feathered Pipe Ranch retreat, we meet flights at the Helena Regional Airport, offering shuttle service for $65 roundtrip. Ride services such as Uber are also available as a transportation to option to the Feathered Pipe Ranch. For those coming to a Blacktail Ranch Retreat, we offer roundtrip shuttle service from Great Falls International Airports for an additional charge of $100. Our driver will meet you at baggage claim wearing a Feathered Pipe t-shirt. We are now grouping some pick-ups, so you may have a 30 minute wait. Please contact the office at info@featheredpipe.com or call (406) 442-8196 to arrange and confirm pick-up. Call the Ranch directly if for any reason there is a change in scheduled arrival on the day of travel or if you have not located your pickup at (406) 443-0430. If you prefer to arrive early and stay in Helena, we will contact you at your hotel to arrange your pick-up. There is plenty to do and see in Helena. Contact our local Chamber of Commerce at (800) 743-5362 or www.helenachamber.com. Helena is half way between Yellowstone and Glacier National Parks (3 hours by car in either direction), so you might consider coming a few days early or staying a few days after your retreat to take in one or both of the country and world’s true natural treasures! What time is arrival and departure? Check-in time on arrival day is 3pm. Please plan to arrive at the Ranch by 5pm so you have time to settle in before our 6:30pm dinner. We will gather for orientation in the evening after dinner. We request that our guests depart their lodging by 9am on departure day to give our staff sufficient time to prepare for incoming guests. If your flight is not scheduled to depart until later in the day, we will be happy to accommodate you and ensure that you get to the airport. How do I get there if I’m driving? The Ranch is located about eight miles the the west of central Helena off of Highway 12. Turn south at the sign for Colorado Gulch. We are at the very end of this road, about 5 miles in. You’ll see rolling lawns, a small lake, and the main lodge on your right. Pull into the parking lot and walk down to the lodge. If you are using a GPS to get to the Ranch, the address is 2409 Bear Creek Rd., Helena, Montana. What do I do if I have an emergency or travel delay that causes me not to arrive at my scheduled time? As we are limited in staff on weekends with everyone busy with departures and readying the facilities for the incoming group, it is essential that you keep the Ranch phone number handy throughout your travels as this is the only way in which you can notify us of a schedule change. The Ranch phone number is (406) 443-0430, or in an absolute emergency contact eric@featheredpipe.com. Our shuttle service is happy to pick you up at your hotel on arrival day. We will notify the hotel front desk of our pickup time the night before pick-up. If you are not able to arrive before 5pm on first day of the retreat due to scheduling problems or flight delays, please call the office (406) 443-0430, and we will be work with you to arrange for your pick-up. Is massage and bodywork available at the Ranch? Absolutely yes! And we’re happy to boast that we have some of the best body workers around. Professional massage and bodywork is available during all retreats. Our practitioners offer a broad range of modalities that support our guests as they to dive into deep states of relaxation, stress relief, and healing to enrich their overall Feathered Pipe experience. Introductions to our bodyworkers and details about how to sign up and where to go for your session will be shared at the retreat orientation and appointments can be made then. It’s a good idea to sign up early as their schedules often fill quickly! Payment is by cash, check, or credit card. We do not have an ATM at the Ranch, but Crystal at the Shanti Boutique accepts credit cards and will do her very best to accommodate your needs. If she doesn’t have something you need immediately available in her store, she will work with you to find a way to get it. How do I contact the “outside world”? You may have to walk out up to the parking lot to cell phone service as we are at the very end of the road up in the Rockies, but we do have wireless Internet access within the Main Lodge, Dining Hall and Chalet via the magic of satellite dishes! If you enable WiFi calling on your smartphone, you will be able to make calls from the Ranch. It’s best not to count on continuously reliable cell phone or high-speed Internet service while you’re at the Ranch. If you need to be reached in an emergency, you can share the main phone number of the kitchen with family and friends that will be sent to you along with your guest information packet following registration. What can I expect when it comes to food at the Ranch? You can expect to eat very well! We are fortunate to have access to organic food through the Real Food Deli and Market in Helena – Montana’s first and only certified organic grocery store. All the meat we serve comes from local organic or transitional producers as does much of our produce. Every day you will enjoy our nutritious salad bars and entrees. Vegetarian, and fish or chicken alternatives are available at most workshops although we do honor the requests of some of our teachers to keep a vegetarian table during their retreat. We happily accommodate most special diets – please remember to complete the allergies/special diet section of the Guest Information Form that you will receive upon registration so we can be ready for you when you arrive. And what about your other amenities? We provide bedding, towels, and all the amenities you’d expect with indoor lodging. This is a cedar wood bathhouse with showers, a sauna, a hot tub and massage rooms. Outdoor lodging guests have their own private storage nook for toiletries and personal effects in the bathhouse. The bathhouse is no more than a five-minute walk from any accommodation. Well-marked hiking trails leading in pretty much every direction allowing you to enjoy time to yourself or wandering with a friend. The lake is fed by a pure mountain spring and as all Montana lakes and rivers never quite warm but more than refreshing if you care to go for an afternoon dip. The wide-open lawn and meadows give you plenty of opportunity to stretch out, read a book from our eclectic and diverse library, or simply gaze up at the Big Sky above and dream away. We have plenty of mats, blankets, blocks, supports and belts as well as well equipped yoga walls, but we encourage you to bring your own mat if possible, clearly marked. What is a typical day at the Ranch like? 6:30 pm – Dinner and optional evening program, time to soak in the hot tub, indulge in a sauna, and relax as you gaze at our spectacular Rocky Mountain sunsets. The atmosphere is casual so please dress for your comfort. Clothes you’ll potentially need include: shorts, t-shirts, a rain jacket, slacks or jeans for chilly evenings, light daytime attire, bathing suit, and a warm sweater or jacket for our delightfully cool summer evenings. Don’t worry about bedding – we have more than enough to keep you warm whether you are in the Main Lodge or snuggled up toasty in a yurt, tent or tipi. Also bring comfortable walking or running shoes for wandering here and there throughout the Ranch grounds, and slippers or socks for wearing in the Main Lodge as we do not allow outdoor shoes on the Main Lodge room floor. You will need a travel alarm clock, flashlight and water bottle as well as cash or a check for any end-of-retreat staff tips you might wish to offer. If I am staying in outdoor accommodations, where are my bathroom and shower facilities? Those desiring to indulge in the full experience of being in Big Sky’s great outdoors by choosing to stay in our yurt,deluxe wall tent, tipi, or tent accommodations will have the bathhouse as your bathroom and shower facility which is not more than a five minute walk from any outdoor accommodation. The bonus is that the sauna, hot tub and massage facilities are as well located in the bathhouse. There’s nothing like a late-night stroll under the stars to your yurt after a perfect day of practice, deep relaxation and a warm soak in the hot tub! Yes please! Near the end of your retreat, we will put out a basket for all tips that the hardworking staff will share equally. If you have been happy with their service, we recommend tipping a minimum of $100. Your voluntary gratuity will help all the wonderful folks who will be making your meals, cleaning the lodging, doing dishes, keeping all the public areas in tip-top shape, tending to any special requirements you may have, and generally just working their hearts out to make sure our guests are happy. Due to limited housing, it is difficult for us to accommodate children, although we sometimes make special arrangements. Please inquire with our office at: info@featheredpipe.com or call (406) 442-8196. Due to the nature of the retreats and Ranch accommodations, please do not bring your pets.